Given the relative ease of gaining horsepower in early Mitsubishi’s, it makes sense that there should be a range of upgrades to the suspension and brakes. Unfortunately there is not a lot of options when it comes to bolting on larger parts from other cars. 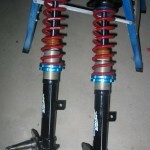 The best swap into any Early Lancer or Galant is the entire front strut assembly from either the GH Sigma or GH Scorpion. Whilst they use common components from other Sigma and Scorpion models, they have a different mounting point at the base of the strut, which matches that of the early Lancer and Galant. Whilst they are a bolt in job for some models, other model require a change to the springs as they are wider then the Lancer/Galant ones and may foul on the strut tower. Also, the strut tops may need changing over, this is not too bad as you can use your original strut tops on the Sigma/Scorpion struts. There are two different model of struts that can be used, the first ones have a mount for the brake callipers cast in to the strut, making brake changes difficult. The second type, commonly referred to as “Green Struts” due to them originally being painted green, have a removable mounting place for the brake callipers, making it very easy to change to larger discs and callipers. From what I have been able to find out, all GH Scorpions were released with the “Green Struts” and some GH Sigmas had them, however I have not been able to verify this information and given the age of the cars, it would be wise to check the struts before purchase if you are after the “Green Struts”. 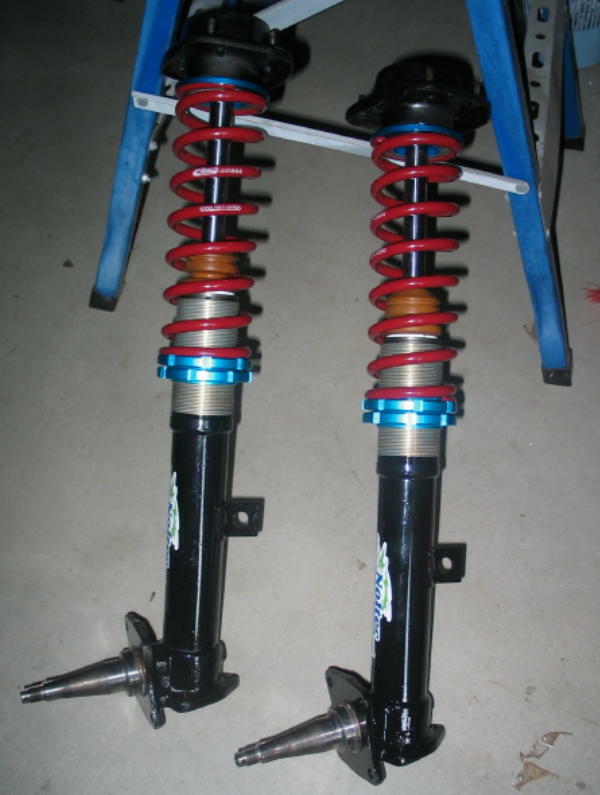 Here is a picture of the modified “Green Struts” that are in my Lancer (click on the picture to view a larger image), they have had coilover hardware and adjustable koni shocks installed as well as being shortened by 70mm. What is not so clear in this picture is the three bolt pattern on the bottom of the strut, if the struts have a two bolt pattern as found in other model Sigma and Scoprions, then they will not fit onto the steering knuckle in Lancer and Galants. No brake hardware or hubs are installed in this picture, they have since been fitted with 298mm Honda NSX rotors and twin spot commodore callipers.